The appetite for unified threat management (UTM) appliances appears to have remained undiminished with WatchGuard talking up its third quarter sales with the UK delivering a strong performance. The privately held company doesn't break down its numbers but has revealed that year-on-year its billings in the UK grew by 26% and indicated that the final quarter would also include a decent volume of sales. The UK growth was surpassed by Central Europe, which saw billings grow by 44% and Southern Europe by 35% and India also stood out with a 22% increase, which was attributed as a consequence of the attraction for XTM appliances in large enterprises and those running managed services environments. 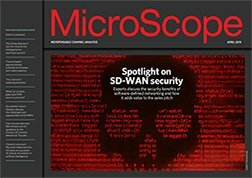 "In today's economy, UTM solutions are consistently being recognised and deployed as the optimal way to secure networks and protect sensitive data," said Joe Wang, CEO, WatchGuard Technologies.